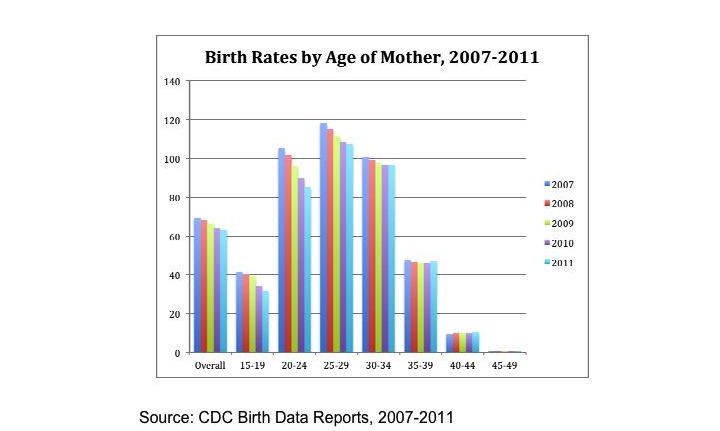 New CDC birth data out Wednesday confirm that the U.S. birthrate dropped one percent to reach an all-time low in 2011, extending the downward trend begun with the recession in 2008. Put down your knee-jerk fears about smaller population. This drop is a good sign, foretelling not a diminished but a strengthened workforce down the line. Historic lows make headlines, but the deep story here is the time-lag ripple effect of delay that this year’s data demonstrate. The big birthrate declines we’ve seen since the recent high in 2007 (down nine percent overall) have been sharpest among teens ages 15 to 19 (a 25 percent drop over the four years) and to young women ages 20 to 24 (down 19 percent). Both of those age bands hit historic lows in 2011. We’re talking framework change here. On the other hand, rates among women ages 25 to 29 have fallen a much smaller nine percent since 2007; those among women ages 30 to 34 fell four percent between 2007 and 2010 and held steady in 2011; and those among women ages 35 to 39 also fell four percent between 2007 and 2010, but rose three percent in 2011. Rates among women ages 40 to 44 never fell: they’d been rising steadily since 1981, and rose another seven percent between 2007 and 2011. What we’re seeing here looks not so much like a big decline in the number of women who have kids over their lifetimes, or even necessarily in the number of kids they have, as like the time-lag effect of postponement. The big switch in the timing of when women have children was underway long before the recession of 2007 (see this CCF fact sheet), but the recession intensified it. 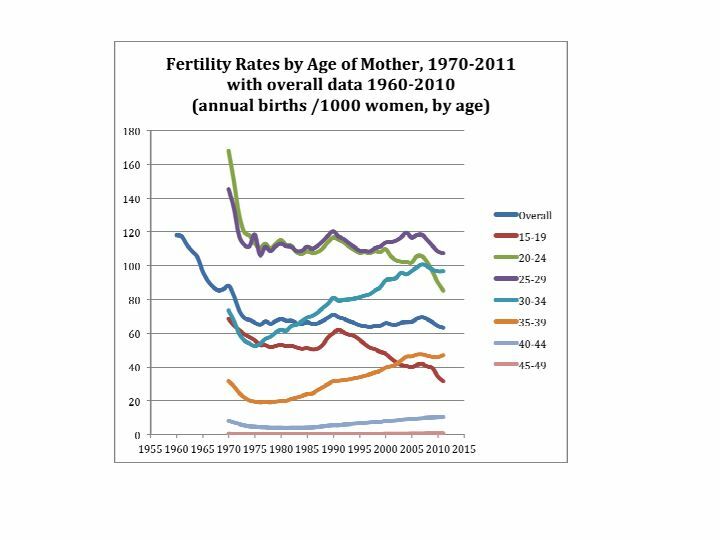 We can see that in the chart below, in the rising birthrates for women ages 30 to 44, and the falling rates for women ages 15 to 29. Already some women who stayed on the maternity sidelines in their thirties in the early part of this decline have jumped back into the game (visible in the rises among women 35 and older). Though the increases to date are not yet sizable, the scene is set for a flood of later mothers down the line. The overall rate of decline was lower than in the three previous years, suggesting that an overall upturn may be on the way in the next year or so. But though the recession officially ended in 2009, younger women’s rates are still dropping drastically in 2011 (down 8 percent from 2010). These indicators confirm that the recovery still needs to gain traction before people trust it with their families. They also tell us that the national birth timing dynamic is changing fast. In their 25 percent rate plunge in just four years, young women today are enacting a sped-up version of the trend to delaying kids that’s been growing since the introduction of hormonal birth control, in 1960. Like millions of women before them, these citizens are refraining from having a first child early on (first births were also at an all time low in 2011), or sometimes a second, and choosing instead to invest in their educations (high school completion and college entry levels are up since 2007) and to build up their credentials at work. They may not be changing the number of kids they’ll have overall by much, but they are changing the economic circumstances into which those kids will arrive, for the better. Not all recession effects are problematic. This sped-up delay effect has at least three overlapping causes. Most obvious is the recession/slow recovery (recessions are historically powerful contraception—before the Pill, the lowest recorded birth rate occurred in 1936). If people don’t feel they can afford kids, they become more vigilant about controlling fertility. A second cause lies in recent improvements in birth control methods and access, which make it easier to be vigilant. A third springs from the fact that not only did young women refrain from having kids for the downturn; because they didn’t have kids quite a few of them were able to complete high school and enroll in college. That put them on track for perhaps a decade of further delay (the time required to finish the Bachelor’s degree and maybe grad school, and then to establish at work) rather than just a year or two (on average college graduate women of all races have their first child at 30). This will have a major positive effect on the workforce, both because these women will be more educated themselves, and their kids—when they do have them in a few years—will be more educated too. In the fertility realm, more does not necessarily mean better. While the current birth-rate drop responds to and signals the continued slow economic recovery, it is also itself a positive sign of economic growth to come. This is not what you’ll hear from the pro-natalist conservatives, who have been pushing higher birthrates, both directly through pledges to support “robust childbearing” and stated concerns that we won’t have enough workers to fund social security for retiring boomers, and more covertly through a coordinated effort to cut access to birth control and abortion. Though this is not the way they’re discussed, the most direct effect of cuts to birth control and abortion is to raise birthrates. Since poor young women would be most affected by such cuts, and many initially middle-class new moms would be pushed into poverty, the anti-birth-control push would lead to more low-skilled workers, including both the babies and more immediately the newly-created parents. That’s just what the nation as a whole doesn’t need, when even in a down economy many US jobs go unfilled for lack of adequately skilled applicants. When the recovery fully kicks in, the skilled-worker shortfall will only increase if we push our up-and-coming workforce off the educational track and into early parenthood. Advocates push this agenda as “pro-life,” but since its major effect is to impoverish whole families, it resonates as a “traditionalist” move back to days in which women knew their “place.” This brings out many older and conservative voters and, by denying access to birth control and abortion, pushes young workers (male and female) into poverty, where they are much more unlikely to vote. Since early births keep women out of the paths to education and cultural power, this kind of pro-natalist agenda reinforces old power networks. When women control their own fertility, the world does change, with big gains for women, their families and society. College-educated women gain on average 12 percent in long-term annual earnings for every year they delay kids. So a woman who has a first child at age 30 earns roughly twice as much for the rest of her career as she would have if she’d had her first child right after graduation, at age 22, and so on up with each year of delay. Without benefit of economic experts, steadily growing numbers of women have figured out through deduction and observation that delay makes a lot of bottom-line sense to families. Delay also serves women as a shadow benefits system in our family-unfriendly work world, making it possible to climb the ranks at work before kids, and then to use your established clout to negotiate your own deal when the kids do arrive. Delay also makes possible the trickle up of women into policy-making roles in business and government. Only when female citizens control their own fertility do they achieve critical mass and win a voice in the way society is structured. The combination of the ongoing intentional trend to delay and the recession-born delay effect will speed up that trickle up, leading to positive outcomes for kids, parents and women overall. 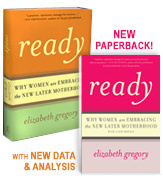 The 2011 birth data tells us young women are not interested in that road back to the old ways. They want good lives for themselves and their families, and they are working to realize that hope by putting babies on hold.